A closer look at how to teach new moves and swap moves in Pokémon Quest. In Pokémon Quest, it’s important to know how to teach Pokémon new moves and swap existing Pokémon moves. This can be done through the Pokémon Quest Move Learning Training feature. Not sure how to use the Pokémon Quest Move Learning Training feature to teach new moves to Pokémon? No worries. To help make the process easier, we put together a quick guide on how to teach and swap Pokémon moves in Pokémon Quest! To teach or swap a Pokémon's moves in Pokémon Quest, you need to know how to use the Pokémon Quest Move Learning Training feature. To teach a Pokémon new moves or swap moves in Pokémon Quest, you’ll need to use the Pokémon Quest Move Learning Training feature. To locate this feature, head to your “Edit Team” menu, then select the Pokémon you wish to swap moves or teach new moves to. With the desired Pokémon selected, you can proceed on to the training section. Here, you’ll find two options for Pokémon training. Note that you can ignore the Level-Up Training section and instead focus on the Move Learning section. In the Move Learning section, you’ll find two possible moves your Pokémon can learn in addition to a success percentage rate. To increase the success percentage rate, you’ll need to add in four supporting Pokémon. It’s worth prioritizing support Pokémon that are the same type as the Pokémon you’re swapping moves or teaching new moves to. With the success percentage rate high enough, select the move you want to replace, then click “start training” to teach that move to your Pokémon. Keep in mind the move your Pokémon learns depends on the Pokémon (including support Pokémon) you’ve put into the Pokémon Quest Move Learning Training feature along with their current level and evolution status. 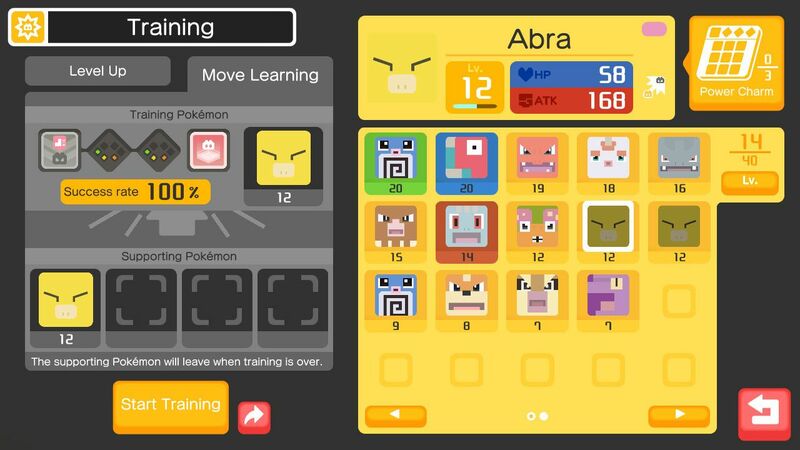 Another way to alter a Pokémon's moves in Pokémon Quest is to use Move Stones to change the properties of existing moves. This is a bit more foolproof than swapping for new moves in Pokémon Quest. With this information in mind, you should be able to swap moves and teach new moves to your Pokémon in Pokémon Quest! For more on Pokémon Quest, be sure to check out our guides including how to farm Honey in Pokémon Quest, how to craft the Ambrosia of Legends a la Cube recipe in Pokémon Quest, and a look at all evolution levels in Pokémon Quest. By reading through this guide, you should now know how to swap and teach new moves to your Pokémon in Pokémon Quest.